Surrounded by pristine mountains and crystal-clear waterways, the coastal seaport city of Vancouver, British Columbia, is a densely populated economic powerhouse with some of the highest real estate prices in the world. It also is a beautiful outdoor attraction with parks and rivers for boating, water sports and fishing. 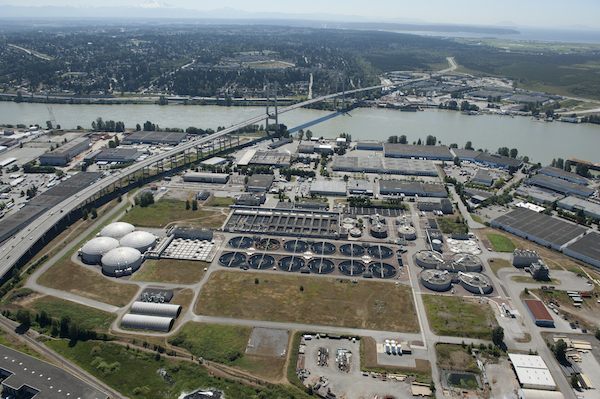 The double demands of high population and high environmental standards put a lot of pressure on Metro Vancouver Regional District’s Annacis Island Wastewater Treatment Plant (AIWWTP), the second largest treatment facility in Canada. Serving approximately 1.3 million people in an area of 14 of 23 member municipalities, AIWWTP’s Influent Pumping Station (IPS) is a critical pumping facility for the treatment plant. A sewerage network of pipes and interceptors and distributed pumping stations transport wastewater to the AIWWTP IPS. The role of the IPS is to lift the incoming wastewater several meters to the primary treatment process. From there, the wastewater is conveyed through secondary treatment processes before it is disinfected and returned to nature via the Fraser River. After nearly two decades of service, the existing variable frequency drives (VFDs) powering and controlling the primary influent pumping as well as secondary treatment processes’ pumping—one of world’s largest trickling filters —were due for replacement. The plan for Terry Louie, senior project engineer for Metro Vancouver, was to replace the existing pumps’ VFDs to minimize the risk of treatment failures due to technology obsolescence. In the case of IPS pump VFD failure due to age and lack of spare parts, there would be a high probability of frontal bypass of untreated water through the treatment plant. This would create an environmental problem resulting in regulatory agency investigations and heavy fines if untreated sewage entered the Fraser River, the world’s largest wild salmon-bearing river system. In the case of trickling filter VFD failure, secondary treatment bypass would occur. This would result in only primary treatment of the wastewater, leading to treatment quality violations with the Ministry of Environment. Either way, these issues create a significant problem for all stakeholders. The VFDs were installed over 12 weeks during the summer—one VFD immediately after the other. The capacity of the Annacis Island plant handles the requirements of the liquid stream processes—treating summer flows and an average monthly maximum winter flow (Oct. to Dec. 2018) of about 202 million gal per day—using three 1,200-hp influent pumps and four 684-hp trickling filter pumps. The influent pumps regulate the level of sewage intake into the wet wells. Wet wells function as holding sumps for the gravity-flow—the final stage of the sewer system to the plant after consolidation from the area collections systems. As sewage enters the wet well, screens remove large debris, and as the water level in the wet well rises, the influent pumps are automatically controlled to lift the sewage into primary treatment tanks. Primary treatment is where initial sedimentation processes occur. If wet well pumps fail during high-flow periods of plant influent, the gates close, forcing frontal bypass of the plant and admitting raw sewage into the Fraser River. The trickling filter pumps are used to lift the primary treated wastewater to secondary treatment process called trickling filters—large dome-covered tanks with media that support biological treatment. At this stage, biological processes in the trickling filters remove almost all of the solids and oxygen-consuming matter from the wastewater. Together, both primary and secondary treatments are critical to meet Canada’s stringent wastewater systems effluent regulations. The plant also must meet the strict provincial and federal requirements of the British Columbia Ministry of Environment; Ministry of Lands, Parks, and Housing; Department of Fisheries and Oceans Canada; and indigenous communities. For example, other jurisdictions can meet effluent criteria based on monthly averages; AIWWTP must meet daily criteria requirements. Consequently, AIWWTP was looking for reliable drive technology. The consulting electrical engineer for the project was Miroslav Zelezny, managing director of EIC Solutions. Zelezny was responsible for initial conceptual design, specifications, drawing approvals and bid selection. To start with, the VFDs, power distribution and control equipment had to fit in the compact 16.5-ft-by-4.6-ft space occupied by the old drives, meet current code clearances, and use the existing cable locations. Drive enclosures also had to be environmentally safe and seismically secured. Furthermore, the facility could not be taken offline during the upgrade. The time window was several weeks in the summer during low process flows and low precipitation, resulting in manageable sewage inflow levels with a single influent pump and therefore less risk to operations. Vancouver has more than 160 rainy days a year with up to 63-in. of rain annually— nearly double Seattle’s rainfall. That time window was planned to begin in mid-June 2017. Although the time window was small, the electrical requirements were huge. The VFDs had to handle 660 volts alternating current (VAC) at 60 Hz and 12 and 18 pulse inputs for trickling filter and influent pump VFDs, respectively. 650 ft in length, and 35 ft of head) triggered by a momentary power disturbance or outage, bring it to a stop, and then resume pump control within 10 seconds. The backspin durations, ranging from 20 seconds to 120 seconds, were problematic for the existing VFDs in restarting, which can only be done near a complete stop. This put plant operations at risk of a spill, especially during peak wet-weather events in which the plant has less than 30 seconds to restart the influent pumps. The VFDs also had to withstand 115% continuous current (motor) and 135% current (line) surges for one minute. On the other hand, in case of power reduction, the VFDs had to run at reduced capacity in the event of a module failure. However, the biggest challenge of all was the requirement to guarantee 97% drive efficiency, plus provide evidence that the VFDs would not fail for 15 years. When the project was put out to bid, it caught the attention of Sunny Draganov, water systems manager, and Doug Kobylanski, vice president of 3 Phase Power Systems. Kobylanski found providing that evidence was difficult for the bidders on the project, but at a conference he found a prospect with Danfoss. Kobylanski said that his interaction at the conference filled him with confidence in the possibility of using Danfoss drives and their potential for reliability in accordance with the bid request. How Reliable Can a VFD Be? Danfoss had acquired Vacon, a large drive manufacturer and began testing of its drives to determine if they could meet the bid criteria at its factory in Loves Park, Ill. The facility was outfitted with a laboratory big enough to conduct testing on the 1,200-hp drive. Ambient temperatures also were changed in testing to force the drives into limiting conditions to see if they would overheat and trip, and they did not. The selected drives for the 600V, 1200-hp, 3-phase influent pump motors were Danfoss Vacon NXP common DC bus VFDs configured for 18-pulse front end with sinusoidal output filters. For the 600V, 684-hp, 3-phase trickling filter pump motors, Danfoss Vacon NXP common DC bus VFDs configured for 12-pulse front end with sinusoidal output filters were selected. The NXP drives were suited for this application because they were designed for heavy industry needs where constant operation leaves little time for maintenance. Electrically, Kobylanski appreciated that the drives use a common DC bus design in which high/low power devices can be separated into individual compartments. Consequently, if one component fails, it does not cause widespread failure and also simplifies troubleshooting and maintenance. Kobylanski led the team of VFD system designers and assembly experts challenged with this project. The NXP has a common DC bus that Kobylanski said was a good platform from which to base its electrical design. Kobylanski employed one rectifier to handle six pulses, which is just one secondary winding of a step-down transformer. Then, he combined three rectifiers to get the 18-pulse three-phase power needed to drive each motor. If one rectifier failed, the motor would still run because even if one module went down, a disconnect fuse would allow the inverter to run over capacity for the other modules to continue to power the motor. The application uses a fiber optic link to communicate between all three modules. The sync software coordinates transistor firing at exactly the right time to keep the motor running and share the current between the output modules. The bid for the AIWWTP project required studies backing up the proposed design so significant testing was conducted by the bidders. Two representative VFDs, one for the influent pump and the other for the trickling filter pump, were full-load tested at the Danfoss Drives factory in Loves Park. For the 1,200-hp drive, the lab applied 1,100 amps to simulate full-load testing, as well as varying amperage to simulate fault conditions. A dynamometer was used to simulate the pump loads. Pre-testing the VFDs helped win the bid by providing evidence that AIWWTP’s stringent performance and reliability requirements were met. The tests were rigorous, and effectively ran each of the drives almost continuously for about 28 hours, Louie added. Despite running simulated abnormal running conditions, the drives had no major fault events. One of the documented results was that during a power loss, the DC bus in the VFD could provide reserve power on the inverter side. The significance is that if input power to the drive is lost, the momentum of the spinning motor can feed electricity back into the drive itself, effectively turning the motor into an electric generator. Enough electricity can be produced to resume pump control within a few seconds. Louie was confident after that experience. He told operations personnel they they would be happy with the drives. Because of the plant’s trust in Louie and Zelezny’s evaluation of the evidence, AIWWTP gave 3 Phase Power Systems and Ross Morrison Electrical, the installing contractor, the green light to integrate all the drives over the summer. Starting in mid-June, the old drives were replaced, on average, one a week without stopping the plant or compromising treatment quality. The IPS installation was completed and commissioned in August 2017. One year later, Louie’s trust proved to be justified. The drives’ track record confirmed the reliability inferred from the lab tests. The drives also operated at up to 98% efficiency, one percent higher than the specified 97% efficiency. In one year of operation, there had not been a single trip or alarm associated with the VFDs. Efficiency was one of the reasons Zelezny liked the documented performance of the drives. More efficient VFDs—the previous drives were less efficient­­—throw off less waste heat. As a result, the efficient drives reduced the heat load in the electrical room, which reduced cooling costs. Annual energy savings from both sources was estimated to be about 600,000 kWh for the seven VFDs installed in two electrical rooms. For Louie, reliability was the most significant issue.